R&B singer-songwriter Arin Ray has come a long way from being a X-Factor hopeful. Getting his start in 2012 appearing every week as Britney Spears’ protege, he received praise from everyone and made it all the way to the Top 10. When he was eventually cut, he was left wondering his next step because the record deals never materialized. Six years later and writing credits including the likes of Chris Brown, Nicki Minaj, John Legend, Young Thug, Jeremih, and many more, Arin Ray has arrived. Thanks to a friendship with Yung Berg, his hits “Red Lights”, “Kae”, and “Right Now” made him the in demand songwriter to work for. 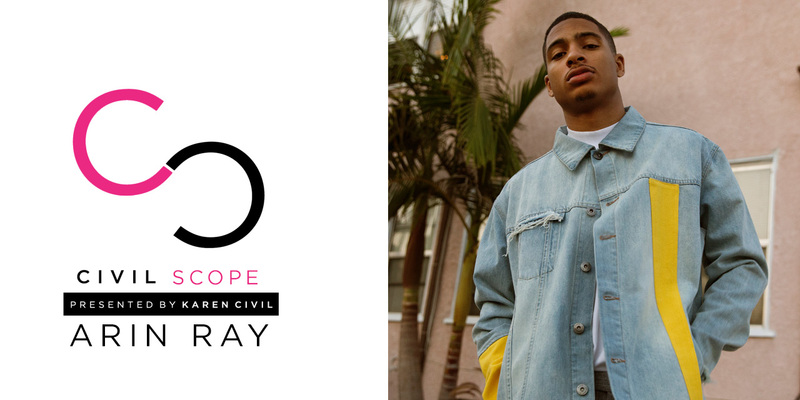 Now with the release of his solo debut album Platinum Fire we here at KarenCivil.com catch up with the emerging star to see what’s on the horizon for him. I know you got your start on X-Factor when you was in the group competition on Season 1 and then the solo competition on season 2, would you care to talk about your experience on there? ARIN RAY: I guess so, I try not to talk too much about it to be honest. My experience was cool. X-Factor was cool, season 1 was cool and I made it all the way to the bootcamp run and then they cut me and put in a group with ten other kids and it didn’t work out. The next season they asked me to come back and do the live audience again and I eventually made Top 10 by myself and that was cool and my experince was probably typical to how those shows go. I’m not really a fan of that process. It was cool as far as my experience being in the business, my first time being in California, first time really being in front of that many people on a regular basis trying to be professional. At that time I was just a little kid and I got a little taste of what it was like and it definitely humbled me because I wasn’t getting calls after that and no one was really hitting me after that. I really was hurt at first and I was seeing my homies getting signed and I sat back like damn I really wish I could be doing that but it wasn’t my time. I figured I had work to do to get back to where I wanted to be and to the point I am at now and I’m still trying to be 10 million times bigger then this. X-Factor was a stepping stone. You built up your name and reputation with your writing credits: working with the likes of Jeremih, Usher, and Chris Brown. How did you get your first writing credit? ARIN RAY: My first actual writing credit I’m not even credited. I did some vocals on the PinkPrint album for Nicki Minaj on the song “Favorite”. Berg was working on it with Jeremih and I did the background vocals on there. But I didn’t have my business right, but now I have my business right. It was really cool and I started with The Underdogs and that’s how I got my start. I wasn’t doing too much with getting placements over there but it wasn’t until I met Berg and we started working with a lot of people like Jeremih, Derulo, Chris. Obviously I have my Chris placements and that’s how I got in there with the record “Kae” with Chris. And I worked with K. Michelle, Young Thug, Yo Gotti, and I had the Meek Mill and Ty Dolla $ign records. We went on a little run, me and Berg, we still have stuff coming I just stepped away from that scene and I definitely was able to be/make a name for myself through this writing and it’s a real blessing. You co-produce if not fully produce all your own material, is that a tool you use to build up your name and your brand? ARIN RAY: Most definitely, I feel like when you can do all things it sets you apart. Not everybody writes their own songs, not everybody produces their music and I think it’s a dope things about me and I do that. I also work with musicians and different producers on my own stuff. When I’m writing for other people I use pretty much any producer. You’re from Cincinatti and you moved to California. Do you feel that moving to California has a significant affect on your sound? And the type of music you make? ARIN RAY: Most definitely. You know, growing up I didn’t really respect the West Coast sound because I didn’t understand it. I was very a super lyrical real East coast rap type fan. I didn’t understand the accents, and voices, the whole California vibe. Like E-40 and all of them. Too Short was real cool. I mean even coming up and listening to YG I didn’t really understand that either but now that I’ve come out here and been in the culture I am able to see how people vibe, how people dance, what music they listen to and gravitate towards that. You can see in some of my music I have the West coast bounce and vibe to it so it definitely influences my music a lot but I get my roots for Ohio and East Coast music. One thing I have noticed is when it comes to artist like Adrian Marcel, You, Ty Dolla $ign, and TeeFlii, all of you guys music has a distinct West Coast flavor to it. ARIN RAY: Especially Ty Dolla. You know I am around it a lot. YG and Push my manager grew up here and I am in the culture all day even if I like it or not. It’s really cool . Both of your parents come from musical backgrounds, is music something you always wanted to do? ARIN RAY: I wouldn’t say always, I guess around highschool when I figured out that I couldn’t play sports. I couldn’t play basketball and I wasn’t meant for football because I was too small and I knew it would work out for me the way I wanted it to so I tried to make a decision. Im pretty cool at this and I took the chance around 9thgrade and then 11thgrade I auditioned for X-Factor and the rest is history. For someone who is so hands on with making their music, what would be the best way to describe your sound? ARIN RAY: It’s soulful, definitely has some hits and some bounce in it, melodic, R&B, alternative and hip hop. If you listen to my melodies I try to take from a lot of different genres. And I’m an old head so I take from that background. Platinum Fire was your debut album, what did you want to tell artistically with this project? ARIN RAY: It was basically around me wanting to give them someone new. I wanted to tell a different story from what everyone else was telling with the same sounds and same kinda feel. I wanted to change it up a little bit and I was really trying to say that I am here to push the culture forward and progress this R&B sound and the sound of music in general. I am here to stay. You recently toured with H.E.R., how was that? ARIN RAY: It was incredible, it was a blessing. They didn’t really know who I was and they just liked my music. I wasn’t known at all and they put me on with H.E.R. and it was a blessing. She was sold out every night and it was a lot of women so I tried to get a feel of how I’m suppose to perform when I’m in that type of environment. So it was really cool and amazing experience. I was learning because it was my first tour. Do you have anymore tours coming up soon? ARIN RAY: We are getting that together. I am doing some shows and some festivals. I have a few college shows and we are getting the rider together right now. I read online that you are working on a Jazz album with Terrace Martin and Robert Glasper, is that true? ARIN RAY: I can’t really talk about that but I work a lot with them. I have a record with Robert, but I can’t say I have an album. I can’t say too much. Okay is it safe to say the Jazz genre is something you are interested in diving into? ARIN RAY: Definitely. I’m trying to get into it more now, you know that’s why I am learning from them now and I am just working with them. Jazz is something I always loved and I did it in school. I just want to do it on a bigger scale. ARIN RAY: Yup! A little bit of keys. I am self taught and I am practicing. I always play keys in my set. Are there any collabs you would like to speak into existence over the next year? ARIN RAY: Definitely would like to work with Jay, it would be dope to have a song with Jay Z that would be cool. Frank, Ye, I was thinking and I want a feature with like Coldplay or Phil Collins. I want some collabs that people would never even dream of. I would want a feature with Sade. Sade would be it. I hope to work with a lot of the younger people. Me and H.E.R. gotta get one in, me and Daniel got to get one in, I have a few under wraps I can’t speak on . It’s definietley something coming thru with the yougin. Drake would be dope and he is on the run. I would love to write a song for Drake. Can people reach out for producing? I work off of vibes, so if I’m in the studio and I feel something then it could work. I started off producing for myself and people are taking notice so now I am starting to work off with other people.